This week, I had the honour of attending a good friend’s wedding. She’s a teacher, too, and although most of our students would be able to tell you that she subs for me when she doesn’t have a contract, and that we hang out at lunch when we have contracts at the same school, our friendship goes back further than meeting in a staff room. We go back to 2010, when we shared a class and a commute. Although we only had one class together while completing our Bachelors of Education, our paths kept crossing. We ended up making mutual friends. We were placed at the same school as student teachers. And we’d often end up riding transit together as we made the daily trek back to Surrey from UBC. We’re both chatty. Conversation flowed easily. Too easily, sometimes. I remember a particular instance where we were so busy chatting that she missed her stop – a stop that she needed to hit so she could buy her boyfriend’s birthday present. So, we became teachers together. Our paths have stayed intertwined as our careers have moved forward. And this weekend, I got to watch her marry the same guy she was on a present hunt for so many years ago. Weddings are exciting. Always. But, for me, this one was excitement rolled in glitter and tinged with nerves. Because it was my first Indian wedding. Now, I wasn’t completely in the dark about what Indo-Canadian weddings are all about, but knowing facts about something and actually experiencing it are two totally different things. And there were some key differences between this wedding and any Christian/civil/western wedding I’ve ever been to. You know. Aside from the fact that the wedding lasted a week. I truly felt like I was at a family event. And, yeah, that sounds obvious, since, well, it was a wedding and there were a ton of family members there. But my husband and I were welcomed and included without a blink. It’s like people took one look at our northern European pigment and switched to helpful mode. People looked out for us, helping us so we could avoid any (major) foibles. And it wasn’t just friends we already knew going into the wedding week. It was their families. Random guests. Event staff. We were so out of out element, but we weren’t lost. Because there was always someone willing to point us in the right direction. One of the first helpful things I ran across were a bunch of offers to lend me clothes. Because I needed a different outfit for each of the four parties I’d be attending. And I don’t exactly own an Indian suit. But yes. The clothes. Not only are they often ridiculously comfortable and surprisingly cool on a hot day, they’re absolutely gorgeous. The suits that I borrowed seriously had more beading than my own wedding gown. And the colours! The colours. The vibrancy of the clothes really added to the feeling that we were celebrating. So, I got to be comfortable as heck while forming part of this rainbow of happiness and excitement. It was pretty awesome. My clothes can’t be compared to the bride’s, though, even if they did have more bling than I’ve ever worn in my life. Her outfits blew me away every time I saw her. And I got to see her often – even before the wedding ceremony. Now, I know this experience didn’t apply to all guests at the ceremony, but the bride welcomed friends in her waiting room. Sure, there was a sign on the door saying that she would make her grand entrance during the ceremony, but close friends and family came and went as we waited for the groom to arrive and appetizers to be finished. I had originally been hesitant to see the bride before the ceremony because it’s been so ingrained in me that the bride hides until she walks down the aisle, but it actually made a lot of sense. We were able to tell her how things were going outside of her little corner of the temple. We could fetch people or things she needed. But, most importantly, we could talk to her. Reassure her. Blab about stuff unrelated to the fact that she was about to get freaking married. There were hundreds of people there for the ceremony. But I was there for her. And I’m glad I was able to see her on such life-changing day. Because if I hadn’t seen her before the ceremony, I wouldn’t have seen her at all given that the reception wasn’t until the following day. Much of what took place last week is rooted in tradition. The sheer number of parties is required to perform the different rituals. Welcoming the bride or groom to the family in various ways. Preparing the bride for the wedding day. Dancing. Singing. Gifting. There are so many individual ceremonies that take place over many days. And it seems like most guests could tell me what was going to happen in each ceremony. Nobody knew exactly why the groom’s family was filling a piece of satin with coconut, or why the bride wears elaborate, dangly ornaments on her wrists. People knew that the dances were traditional, and could in some cases say where they originated, but were unsure of the reason for their performance. I had a lot of questions during these types of ceremonies, but many of them went unanswered. I was a bit stumped by that. I mean, these big parties are thrown specifically for these rituals, but even the bride wasn’t always sure of why things were happening – just that they were part of the wedding rituals. I’m not sure why the bride and groom aren’t supposed to see each other before the ceremony in western weddings. I don’t know why catching a bouquet or a garter means you’ll be the next to marry. I have no idea why we wear wedding rings on the third finger of the left hand. But I just go along with it all anyway. So I stopped asking questions. I just watched. White privilege is something that I acknowledge, but I had never had to acknowledge it so overtly as I did this week, when I was literally the only white woman in a room of three or four hundred people. And, to be honest, I wasn’t expecting how much my skin colour would influence what I could do. I mean, I’m often the only white person in my classes at the very diverse school in which I work, but it’s never been more than a mutual learning experience for me and my students. So I didn’t expect that it would be a big deal at these wedding events, when I was dressed in Indian clothes and glued to friends so I could copy them and do the right things. And it wasn’t a problem, exactly, but it was definitely a learning experience. Because my skin colour gave me a major advantage over the vast majority of women at these events: I could drink alcohol. Openly. I could order my own drinks at the bar. I could position my glass near me at the table. Hell, I could walk with it and take a sip standing right near a group of older, very traditional guests and nobody would look at me sideways. But my friends couldn’t do that – even if they’d wanted to. 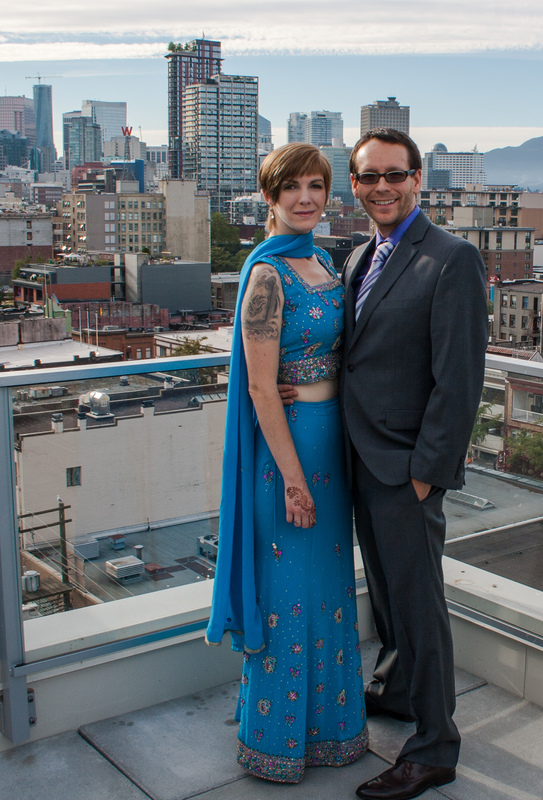 So, I was a bit of a novelty last week – the white woman in the Indian dress, holding a drink, her hands decorated in mehndi, wearing a symbolic red string bracelet. But this wedding was more than a novelty to me. And I was more than that to it. It was the culmination of five years of friendship. And I’m honoured to have been a part of it.